Singapore, Sept. 9 (CNA) In response to the new southbound policy announced by Taiwan’s government recently, Taiwanese plastics companies are now seeking to expand their presence in Singapore and other Southeast Asian countries, lauding their plastics products with high added value as their source of competitiveness. Hsieh Sheng-hai, secretary-general of the Taiwan Plastics Industry Association, said the government’s new southbound policy — which encourages Taiwanese companies to look to South Asian, Southeast Asian and South Pacific countries as investment destinations, export markets and sources of tourists — provides new opportunities for companies in the sector. Noting challenges resulting from the increasing wages in China, Hsieh said that Southeast Asian countries have advantages such as relatively lower labor costs and the emerging markets in the region are also rich in natural resources, making them a good choice for the plastics companies. He made the comments as he led a group of Taiwanese plastics companies to attend the three-day Build Eco Xpo (BEX) that concluded Friday. The companies are doing business in areas such as plastic pavement tiles, water-proof paints, giant trash cans and plastic boards for industrial use. 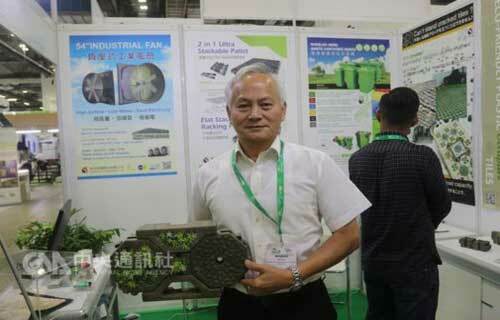 The exhibition is a major trade show on green building in Southeast Asia. Pointing out Taiwan’s competitive advantage in Southeast Asian countries, Hsieh said Taiwan’s high-quality packaging materials and products have a competitive edge in Thailand. He said the textile and shoe manufacturing industries in emerging markets, such as Myanmar, Vietnam and Laos, also offer potential business opportunities for Taiwan’s plastics companies. And as engineering plastics are important components in the electronic business, he said Indonesia and Malaysia offer opportunities for Taiwanese companies in this area. Hsieh noted that Taiwan’s plastics industry has been upgraded from an original-equipment-manufacturer model to one that can manufacture products with high added value, a strength for Taiwan’s plastics companies to enter the Southeast Asian market. The “New Southbound Policy” was adopted by the administration of President Tsai Ing-wen, who took office on May 20. It is aimed at enhancing trade and economic ties with countries in South Asia, Southeast Asia and the South Pacific, in an effort to diversify Taiwan’s trade relations and avoid over-reliance on China.